KUALA LUMPUR: The ‘Sang Saka Biru’ song echoed across the country as members of the Royal Malaysia Police (RMP) celebrated the 212th Police Day today at all state and district police headquarters nationwide. 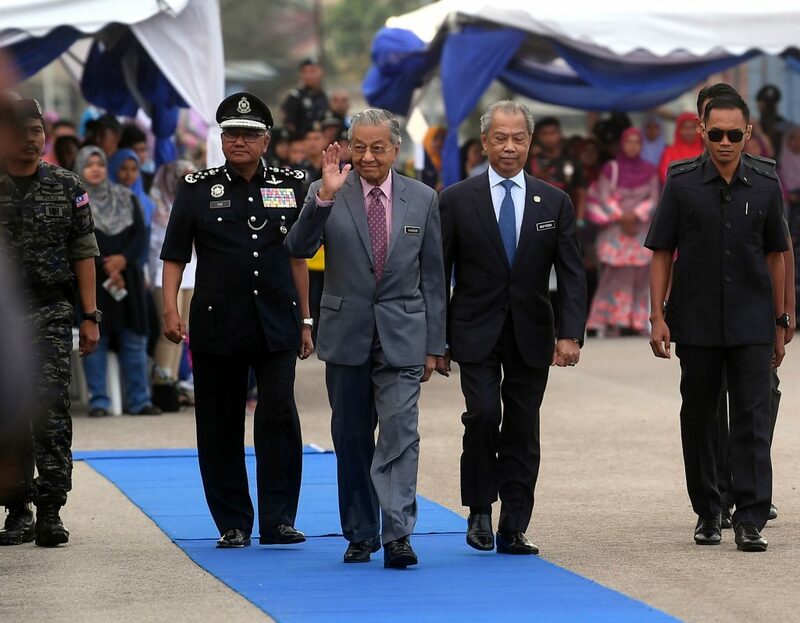 At the Police Training Centre (Pulapol) in Jalan Semarak here, the celebration was graced by Prime Minister Tun Dr Mahathir Mohamad who also inspected the guard of honour mounted by 29 police officers and 932 members. He was accompanied by Inspector-General of Police Tan Sri Mohamad Fuzi Harun. In his message to the police personnel, Dr Mahathir also gave assurance of the government’s commitment to continue channelling all the necessary allocations to the RMP even though it would involve additional costs. 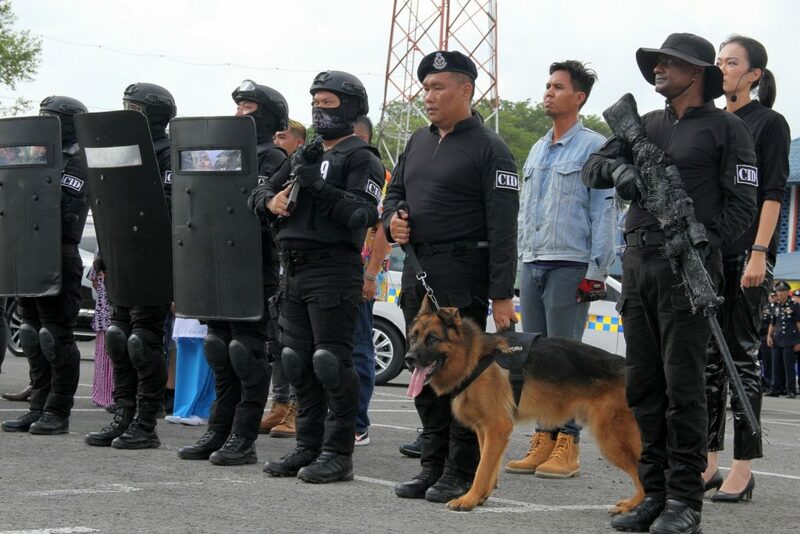 The 212th Police Day parade which maintains the theme of ‘Polis dan Masyarakat Berpisah Tiada’ also displayed 98 RMP assets from various departments such as the Federal Reserve Team (FRU), the Special Actions Unit (UTK) and the Marine Police Force. Also present were Home Minister Tan Sri Muhyiddin Yassin and Attorney-General Tommy Thomas. In Terengganu, the Police Day was celebrated in the high spirit of patriotism by 3,647 police officers and staff at seven district police headquarters statewide. Terengganu deputy police chief Datuk Allaudeen Abdul Majid read the Inspector-General of Police (IGP) message and presented a certificate of appreciation to 48 members of the police force who had displayed excellent and exemplary performance in the service. In Johor, the Police Day celebration which took place at the Johor Police Contingent headquarters’ marching field, commenced with a parade at 8.30am to commemorate the date of the establishment of the police force on March 25. It was followed by an inspection of the guard of honour mounted by two police officers and 48 personnel by Johor Police Chief Datuk Mohd Khalil Kader Mohd. Mohd Khalil then read the IGP message and presented a certificate of appreciation to 137 recipients comprising police officers and staff, as well as members of the public. 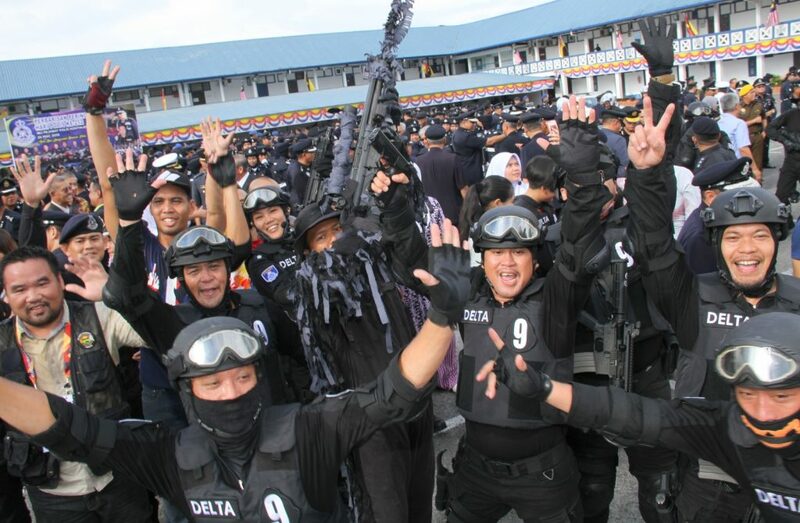 In Sabah, a total of 857 police officers and staff participated in the parade in conjunction with the 212th Police Day celebration held at the Sabah Police Contingent headquarters in Kota Kinabalu. The celebration began at 7.45am with an inspection of the guard of honour by Sabah Police Deputy Commissioner Datuk Zaini Jass who later read the IGP message and presented the certificates of integrity and appreciation to 39 recipients. In Sarawak, the Police Day Parade was held at the Sarawak Police Contingent headquarters’ marching field in Kuching with the participation of more than 250 police personnel of various ranks. The celebration began with an inspection of the guard of honour mounted by two officers and 53 policewomen by Deputy Police Commissioner Datuk Mohd Dzuraidi Ibrahim. He then read the IGP message before presenting RMP certificates of integrity to 60 police personnel, Letter of Appreciation for Rejecting Corruption to one recipient and certificates of appreciation to two members of the public. In Pahang, Pahang Police deputy chief Datuk Mohd Yusri Hassan Basri officiated at the state-level Police Day celebration at the Pahang Police Contingent headquarters in Kuantan. He also inspected the guard of honour mounted by two officers and 51 policewomen before reading the IGP message and presenting the certificates of integrity and appreciation to 60 recipients comprising police personnel and also members of the public. In Negeri Sembilan, the celebration was held at the Negeri Sembilan Police Contingent Headquarters Training School marching field while the IPG message was read by the head of the State Department of Crime Prevention and Public Safety, ACP Samad Yahya. At the event, 47 police personnel received certificates of appreciation while three officers from the Prison Department received a special certificate of appreciation. Several members of the media also received certificates of appreciation. In Kelantan, 51 policemen, including two officers, participated in the parade in conjunction with the Police Day celebration at the Kelantan Police Contingent Headquarters (IPK) in Kota Bharu. here. The celebration started with parade and inspection of the guard of honour by Kelantan Police deputy chief Datuk Azmi Abu Kassim who later read the IGP message. A total of 69 individuals received letters of appreciation, namely 16 senior officers, lower-ranked personnel (32), public officers (one), Police Family Association (Perkep) (five), police pensioners (three) and media practitioners (12). In Melaka, Melaka Chief Minister Adly Zahari graced and delivered his message at the state-level Police Day celebration, which saw the participation of approximately 500 police personnel. The event also saw 17 police personnel received the Melaka RMP integrity awards. In Perak, heavy rain did not dampen the spirit of about 250 police personnel in celebration the Police Day at the compound of the Perak Police Contingent headquarters in Ipoh. Perak Crime Prevention and Community Safety Department head SAC Mohamad Laham read out the IGP message on behalf of the Perak Police Chief Datuk Razarudin Husain @ Abd Rasid, before presenting certificates of appreciation to 128 recipients. In Kedah, the Police Day celebration was held ceremoniously at the Kedah Police Contingent Headquarters in Alor Setar. It began with an inspection of the guard of honour by the Kedah Police Chief Datuk Zainuddin Yaacob followed by the singing of Sang Saka Biru song by personnel and officers, the recital of prayers and reading of police pledge. In appreciating the services by various parties who assisted RMP, Zainuddin also presented certificates of appreciation to 51 recipients from various categories including the public, police retirees and the media. In Penang, a total of 171 police personnel, non-governmental organisations and innovative and creative groups (KIK) leaders received certificates of appreciation in conjunction with the 212th Police Day celebration. ‘Sang Saka Biru’echoes across M’sia in nationwide Police Day do 0 out of 5 based on 0 ratings. 0 user reviews.